After a minor set back at the hands of the Boston Bruins back on Tuesday March 10th, some thought it would be a deeper cut then it ultimately turned out to be. The loss to Boston, put Ottawa 7 points back from the club they were pursuing and ended their nine game point streak where they were 8-0-1. Fortunately for the Ottawa Senators, they have shown great resiliency over the past two months and just won’t lay down. Since losing to the Bruins, the Senators have picked up six straight victories, including their rematch nine days later against Boston in which they picked up a 6-4 victory. They have also defeated the Montreal Canadiens, New York Islanders, Philadelphia Flyers, Carolina Hurricanes, and most recently the Toronto Maple Leafs. With their win over the Leafs, they now sit just 1 point behind the Bruins and hold 1 game in hand. One benefit the Senators have over their final 11 games is that they face the lowly Toronto Maple Leafs on two more occasions. Boston plays 7 of their final 10 games on the road where they have tended to struggle this season. Boston loses in a shootout. 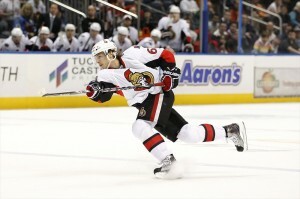 @Senators 1 point back of the Bruins for final playoff spot in the East. During Ottawa’s 6-game winning streak, Kyle Turris has picked up 5 goals and 2 assists as he is showing his capabilities of being the Senators go-to-guy when it matters the most. His end-to-end rush in overtime to set up Mark Stone’s winning goal against Carolina was pure brilliance. He is becoming everything the Arizona Coyotes wanted him to be when they took him 3rd overall in the 2007 NHL Entry Draft. Ottawa is licking their chops after acquiring the play-making trigger man from Arizona in 2011 for defenseman David Rundblad. With Turris doing his thing up front, and Andrew Hammond being excellent in the crease, Erik Karlsson has turned an average season into a spectacular one. On December 20th, Karlsson had 7 goals, 23 points and a +/- rating of -15 in 32 games. Since then, the Landsbro, Sweden native has been on fire with 12 goals, 35 points and an impressive +/- rating of +23. His play since the Christmas break has been night and day as he has helped turn the struggling Senators into a team no one wants to square off against. Nothing is wrong with a little celebratory burger after a victory right? After the Senators defeated the Boston Bruins 6-4 on March 19th rookie forward Curtis Lazar took advantage of the current hamburger craze taking the Nations Capital by storm as he munched down a burger during the post-game celebration. After pigging out a little, the 19-year-old may have felt he needed to contribute a little more to the score sheet the following game as he picked up his 4th goal of the season in 23 shifts and 15:14 of ice time against the Leafs. He took a feed from Jean-Gabriel Pageau at center ice before speeding in and beating James Reimer with a quick snap shot high stick side.